Unfortunately, I'm very late on this one (I've been travelling and spent Saturday at Walter Reed visiting with Chuck and Carren Ziegenfuss and Joey and Jayme Bozik- more on that some other time). 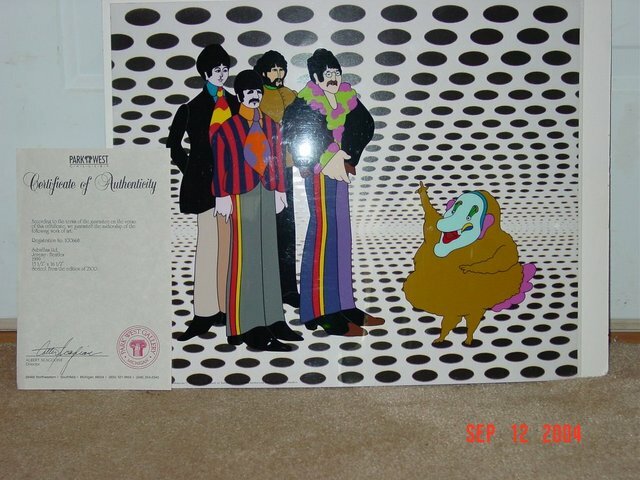 Toni at Random Bits of Pomposity is a Beatle's Fan and is putting up her Sericel "The Beatles" Limited Edition 2500 "Sea of Holes" starring The Beatles! for auction on eBay. Here's her post about it. Here's the link to the eBay auction. Today is the last day of bidding and the proceeds will go to Valour-IT. Valour-IT provides laptops with voice-recognition software so that wounded soldiers can communicate with friends and family.